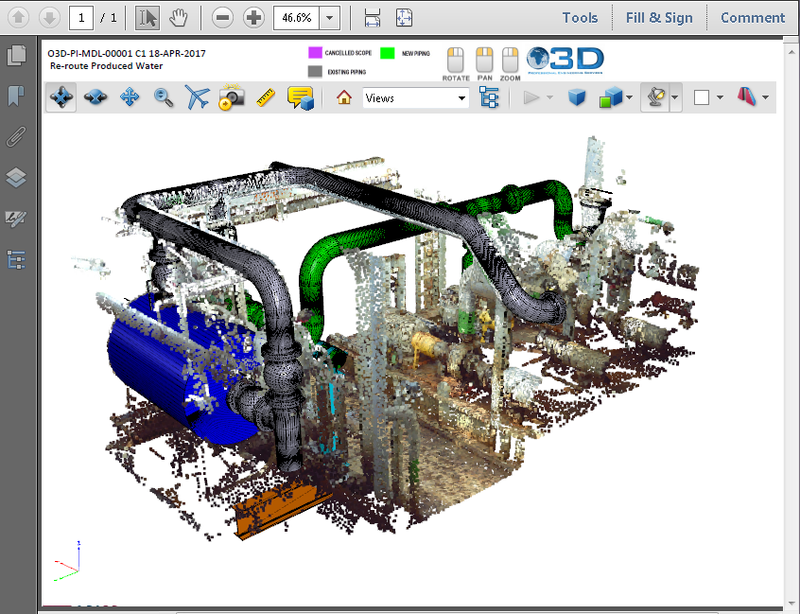 Take our recent ReportGen client at Offshore 3D, for example, who often integrates laser-scanned survey data for pipe routing (see above image) into 3D CAD models (typically using AutoCAD) that can then be built on. When architectural or CAD drawings aren’t available, engineers start by conducting a full site laser scan survey and theodolite survey to determine the existing structure on the client site, to ensure accuracy of the model. After integrating the laser scan survey data into CAD 3D models, all materials for the design change are defined in accordance with the piping class manuals and industry codes and standards. The Laser-Scan 3D point cloud data from the as-built structure is clipped, prepared and referenced and merged with a proposed CAD design of the new pipe routing, ready for review – which is where delays can then follow, if recipients of the data don’t have access to AutoCAD. Enter PDF3D ReportGen. Our client merges the AutoCAD 3D drawing file with the point cloud using PDF3D ReportGen to create a layered 3D PDF report. The legend, title block and project notes are brought in to complete the 3D PDF report. Each separate input file is represented as a controlled layer in the 3D PDF. Multiple Laser-Scans and Multiple CAD files can be merged with meaningful layer names for comparison and discussion. Part Assemblies within individual CAD files are also converted to layers. By merging layers from laser scan survey and mechanical design pipe layouts in the same 3D PDF view, the engineers were able to quickly assess the situation and collaborate to plan the re-configuration work on the pipe structures. The 3D PDF conversion not only helped by creating a format easily shareable and accessible by most people, but also allowed our client to enhance his report a rich, interactive and annotated visualisation. This allowed instant discussion, review and changes between the client and on-site teams. Any industry that works with complex 3D scanned data can benefit significantly from tools that streamline workflows, collaboration and communication between teams, and it’s encouraging to see how the oil and gas industry, for one, is embracing ReportGen as one of those tools. Discover more about how 3D PDF is used in engineering and mining. Offshore 3D is a leading 3D laser scanning, design and engineering company operating globally within the Oil and Gas sector. Founded in 2012, Offshore 3D is a leading 3D laser scanning and engineering company, based in Aberdeen, Scotland. Operating globally within the Oil and Gas sector, the team of highly experienced Surveyors, Designers and Engineers specialise in Piping and Mechanical design and engineering solutions within the Brownfield sector for offshore topsides, drilling and onshore projects. Sample PDF available on PDF3D Sample Gallery for download and review.